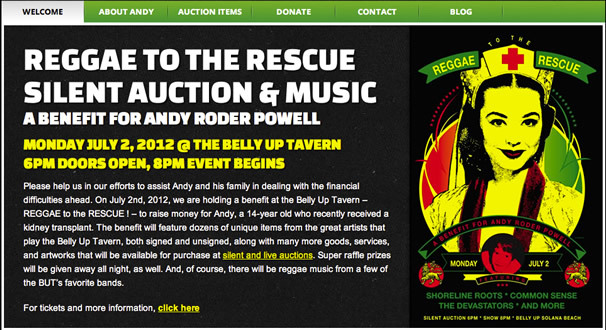 Reggae to the Rescue, a benefit concert and silent auction hosted by Chris Cote of Transworld Surf and Fuel TV, is being held on July 2, 2012 at the Belly Up Tavern in Solana Beach to raise money for Andy Roder Powell, a 14-year old who recently received a kidney transplant. 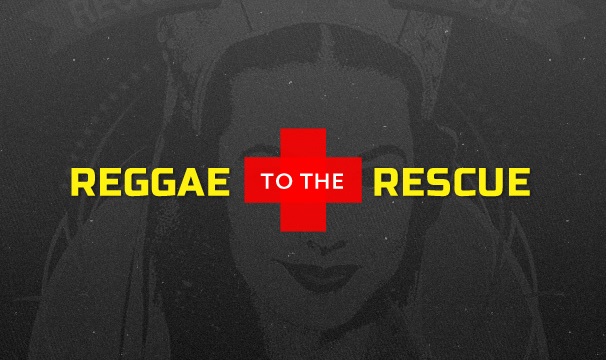 The website can be seen at: http://www.reggaetotherescue.com and features information about Andy and the event where they will also be getting a film studio rental. Auction items are listed, as well as contact information and a donation link. This event space rentals will feature dozens of unique items from the artists that play the Belly Up Tavern, both signed and unsigned, along with many more goods, services, and artworks that will be available for purchase at silent and live auctions. Super raffle prizes will be given away all night, as well. And, of course, there will be reggae music! In addition to the time and effort put into the website, Ninthlink will be attending the event and encourages everyone to come on out for a good time and a great cause. We wan to thanks to our sponsors at https://the-indexer.com/web-development-companies/ for supporting us. David has been a Project Manager with Ninthlink since 2009. He enjoys the beach, electronic music, outdoor activities, traveling, and dominating in fantasy sports.